In some cultures, it’s traditional to eat lentils on New Years day for good luck, but I decided to get my lentil luck on a little early early and end 2007 off right. I found this recipe on epicurious but changed it to add in some greenery in place of some of the sausage. The kale went really well with the dish and it’s definitely something I’ll make again. It’s the makings of a new year’s staple, I think! For the cheese in this dish, I used an organic Parmesan that I bought at a pretty amazing Vancouver market, Tosci & Co. It’s the oldest Italian market in Chinatown (and I’d venture to say in this whole city) and I had always been afraid to step inside since you have to ring a bell to be let in. I must have been crazy to worry about that because it’s pretty much my favorite store now. I wrote a post about it over at Bazaar on the Food Network Canada site. Take a look and leave a comment! 1. Heat oil in heavy large skillet over medium-high heat. Add onion, garlic, peppers and sausage and stir about until the sausage is brown. Add in the kale and saute until softened. Add wine and cook until almost all liquid evaporates, about 2 minutes. Stir in lentils and cook until mixture is heated through, about 3 minutes. Season to taste with salt and pepper. 2. Meanwhile, cook pasta in large pot of boiling salted water until al dente. Drain well, reserving 1 cup pasta cooking water. Return cooked pasta to pot. Add sausage-lentil-kale mixture, cheese and toss to coat. Add enough reserved pasta cooking water to moisten. Season to taste with salt and pepper. Serve with additional cheese if needed. In the Greek culture it’s symbolic on New Year’s Day to have foods that are stuffed so that your house will be full(or stuffed), so on that note – my mom’s making cabbage rolls and some kind of roulade stuffed with cheese, among other things for tomorrow’s feast. I’m hanging out at home this eve with some movies and a pizza as it appears some kind of contagious bug has been circulating and our original evening plans were cancelled. This lentil recipe can totally be made veg with the inclusion of veggie sausage which can successfully add that smokey flavour to lentils. Yum! Kickpleat – Here’s to a Happy New Year full of inspiration, good food and optimum health!! Field Trip! A new Italian market ( well apparently not so new) that I haven’t been to… I am sooo excited! Thanks for sharing… the bell would have intimidated me too! 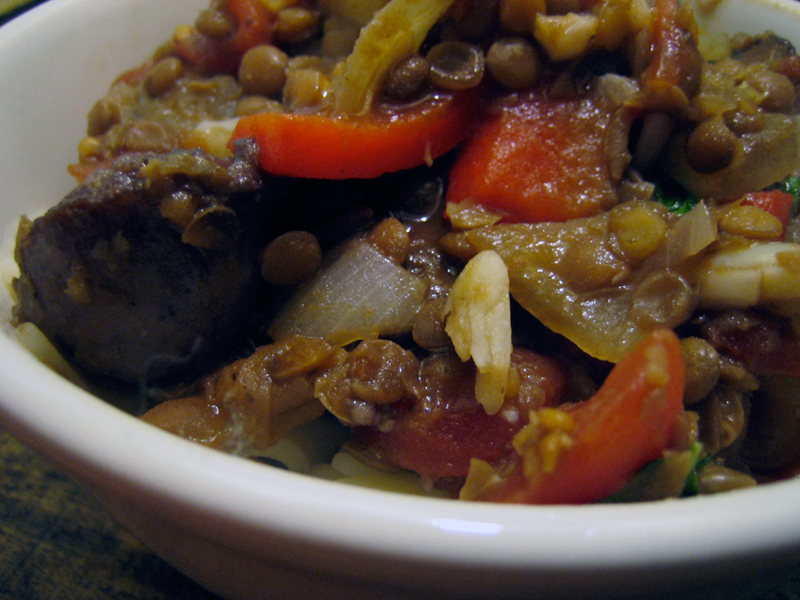 And thanks for the lentil recipe…always tryin to get more of those. are Chinatowns trying to eat Little Italys the world over? So strange… Anyway, happy New Year! What a wonderful soup with which to start 2008! Happy belated New Year, to you!! Thank you for a marvellous year of reading your blog! I’ve enjoyed it enormously and wish you a happy 2008 and continued blogging! i love that tradition..getting stuffed takes on a whole new meaning! hope you had a lovely new years eve…being cozy sounds pretty good. happy new years to you! yes, hag, you’ve got to go! it’s an amazing market!! anne, this chinatown grew really fast and pushed the italian area to a different part of town! so where i live i’m sandwiched between chinatown and little italy. i love it! aw shucks toffeeapple! happy 2008 to you. as for the blogging, i have no plans to stop. thanks for reading! Can I seriously come over for dinner soon? …… your recipe sounds so yummy…..